The upgrade of this popular community facility created a social hub that locals flock to for health and fitness, year-round. When Ignite began work on the redevelopment of this recreational pool facility in Otara the team was acutely aware that we were not just working for Manukau City Council, but for an entire community. Partnering with Australian firm, Suters Architects, Ignite tackled this major public works project by balancing the needs of the community with the confines of existing infrastructure. Consulting with the largely Maori and Pacific Island community created a clear understanding of what locals expected from the new complex. They wanted a facility that provided sociable spaces for families, outdoor recreation facilities and, most importantly, a safe place to teach children to swim. The original facility was constructed in 1974 and consisted of one indoor and one outdoor pool. Subsequent alterations had seen a sports hall and fitness centre added to the complex. Existing infrastructure included a series of disjointed buildings and a confusing system of entrances. Ignite’s design concept focused on improving cohesion and the connection between old and new buildings, and providing good flow between indoor and outdoor spaces. 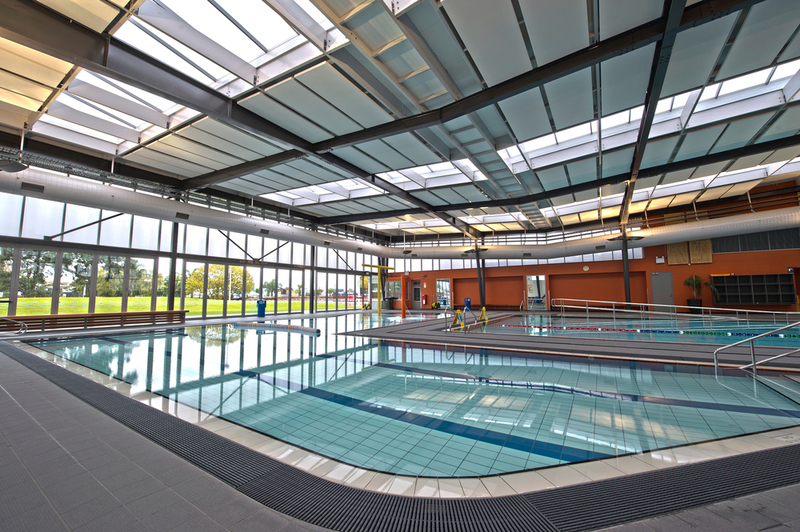 As a result, the new Norman Kirk Memorial Pools complex offers three indoor pools within a large hall, one outdoor pool, a fitness centre and an enhanced garden area. Locals of any level of ability can now enjoy year-round swimming and fitness facilities. Referencing the cultural traditions of Otara’s local population, Ignite drew inspiration from Polynesian inspired concepts. The large, single-roof of the Pools Hall is reminiscent of a traditional whare or fale. Colours and additional design details also reference this theme. Creating a facility that works as one cohesive whole required the new buildings to sit easily and effectively with the old ones. The new hall nestles in with the existing administration block, there is one clear point of entry, and enhanced visual connections help tie it all together. The design incorporates a passive design concept using the sun’s energy to provide natural light and heat. Insulation assists with heating and ventilation and, when the Auckland weather is at its best, the northern façade of the Pools Hall opens up to the garden for a breezy reference to the Polynesian voyaging tradition.